Westport, CT had another first on the weekend of May 31 & June 1 – the largest regatta in the 127-year history of the Cedar Point Yacht Club. More than 400 sailors from Texas to Maine gathered for the 2014 CPYC OneDesign Regatta, which assembled 100 boats for seven sets of races, three of which were also championships: the Soverel 33 Nationals, J/30 Long Island Sound Championship, and J/70 New England Championship. As the cannon sounded on Saturday the winds were brisk, the skies sun-drenched and the competition fierce. With all seven competitions unfolding at once, the course was crowded with sailors vying for every advantage. By the end of the weekend, a team of CPYC members from Westport had finished near the top. 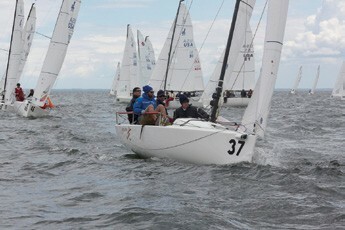 Revelation, owned by George, Ann and Alex Wilbanks, finished fifth in the 14-boat J/015 class. Congratulations to the Wilbanks and crew, including Westport’s Sarah Hamm. CPYC’s Ched Proctor of Southport, CT, a sail designer for North Sails and legendary for his sailing accomplishments around the world, came in second in the Viper 640 class on Mambo Kings, owned by Justin Scott of Greenwich, CT. Proctor said Saturday’s breezes created a challenge for the lightweight Vipers and J/70s, which lifted when the winds picked up, but it also was an opportunity. “The winds changed to the Northeast, and the sudden shift was good for us as we ended up in the right place,” he said. Westport sailors finished well in other classes. 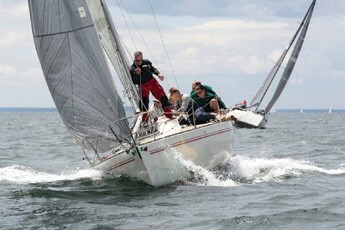 In the Soverel 33 National Championships, Keing McCarthy was a crewmember on the winning boat, G. Mark McCarthy’s Sláinte. In the Beneteau 36.7 class, fourth and fifth place went to members of the Saugatuck Harbor Yacht Club, Junius Brown and Alistair Duke, respectively. Full results are posted at YachtScoring.com. Sponsors of the 2014 CPYC One-Design Regatta include Fairfield County Bank, McMichael Yacht Brokers and Yards, North Sails, West marine, Landfall, Quantum Sail Design Group, BRYAC, Rex Marine & Cove Marina, Atlantic Yacht Rigging, and Save the Sound. Cedar Point Yacht Club took its name from the point of land on the eastern shore of the entrance to the Saugatuck River from which members’ boats were launched and races were run, which actually is part of Compo Beach although today the club is on Saugatuck Island. The original fleet, consisting mostly of catboats and sloops between 20 and 33 feet, numbered around 20. A detailed handicap system was installed and formal courses laid out across the area in which today’s fleets still race.